(SA) Recovery in Economy: How Indian Economy Would Fare With The Large Fiscal Deficit by the End of Year 2009? Is the 35% to 70% rally in a global stock market showing the recovery in the global economy or it is just a bear market rally? But its clear, this rally cannot be justified why? Lets start read the whole review. Even before the World Bank prediction, VMW have already made a bleak outlook for the global economy. Since Mar, 2009 – equity markets has rallied by more than 30% from their Mar ’09 lows. What we could expect from this? Is it showing the recovery in the global economy or it is just a bear market rally or it is just giving some hope of recovery in the global economy? Whatever the recent trends in the global financial markets are developing, but the situation is still unclear. Economies are still struggling, investors are still losing their wealth, banks and financial companies are still losing their profits, credit market are still nervy, people are still very anxious about their job prospect, consumers are still shunning from the spending, companies are still losing their markets, and there are lot of other problems, which are revolving around us. Everyone is questioning about the economic prospect. For how long, this recession will last? When we should see the time of better prospect which we had witnessed before this crisis? Do you believe, the economy is now going to settling down or at least set to recover from here? Hmm…Yes, but not at a full pace. Since the crisis has embarked, banks and financial institutions have lost more than $700 billion in total losses, and it is not very easy for them to recover from this huge massive trouble in a very short period of time. Banks and FIs are striving to sustain their business in these tough times. Financial condition of the banks however is still not in a good shape and their bad assets in a balance sheet are still a major setback for them to recuperate from this. However, the government authorities and central bank around the world are taking adequate measures to heal the bank’s pain to put these banks back on the growth track. What are the Problems/Challenges, Indian Economy is facing? Now, let’s talk about the Indian economy and its financial system. Indian Government is persistently putting pressure on the Indian Banks to reduce interest rates to the important sectors like Real Estate and Infrastructure. The liquidity situation in the country was very fickle and lot of apprehension in the call money market when the global recession was at a peak during Sep, 2008 followed by the collapse of Wall Street investment bank Lehman Brothers Holdings Incorporated. 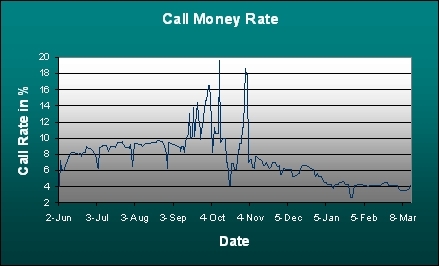 At that time, banks even unable to lend to each other, resulted call rates jumped up to 20% (See Exhibit 1 for the reference). However, the liquidity is now at a comfortable levels and call rates lingering around 3% and 4% and even falls below 3% in May ’09. If the Indian economy has an adequate amount of liquidity in the system, so why banks and financial institutions are still dis-inclining to lend? Firstly, this crisis proved to be the disastrous one especially for the international banks. Indian banks are still far better than the foreign banks. In India, banks have only saw decline in their revenue growth and profits and in some cases mark to market losses (largely known by MTM losses), however the foreign banks have lost almost trillions of dollars in the last 6 quarters and still struggling to do their business as usual. So, here the reason could be the lack of confidence. Secondly, the higher cost of credit. In India, the banks are largely depend on the time deposits (also known as Fixed Deposits or Term Deposits) for the primary source of funds to lend in which they have to offer more than 7% interest rate to the depositors. The cheaper source of credit to the banks is Current Account and Savings Account deposits (also known as Checking Account). Generally banks offer 3.5% to 4% interest rates on Savings Account and nil on Current Account. That is the reason – banks are now focusing on to reduce the cost burden. Stimulus Package Announcement? To refuel the growth in the export oriented industries, newly elected government should consider announcing Stimulus Package for the export industry such as Textiles, Gems & Jewelers, Steel and other industries which are vastly depend on the exports and to focus on the lower cost of credit to revive the infrastructure, Real Estate sector and Auto Sector. 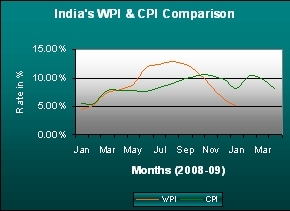 India's CPI and WPI Comparison for Year 2008. Earlier, we’ve mentioned some important points which are specifically have certain influence on the Indian Economy. Out of those, one the most prominent is the variance between the WPI and CPI which actually making difficult for the RBI to take stance. Since the change in base year in Wholesale Price Index (WPI), inflation has steeply fallen from over 10% to almost zero within 6 months and interestingly, CPI has not been affected that much and still at over 8%. This is going to be a troublesome for the Reserve Bank of India while considering any change in its monetary policy. RBI should consider CPI numbers while taking any appropriate decision on the interest rates. Overall the inflation rate has created confusion for the RBI, that is the reason, the Indian Ministry of Statistics and Planning Implementation (MosPI) is going to launch CPI next year. US Dollar Trivializing and Euro Gaining Fiat Currency Status? Now, the another important developments since last year is rising Fiscal Deficit. This is not a single problem in the Indian Economy alone, actually many economies around world are facing the same kind of threat. US and UK probably would face the de-rating of their Bond/debt from the credit rating organizations. What would probably going to happen? Of course US Dollar may witness significant reduction in its value against the major currencies as the biggest creditors – China, Japan will sell US Treasury en-masse. The world’s fastest developing nations like India, China, Russia, Brazil are the biggest holder of US Dollars and may consider to revise their dependence on the US Dollar and in that case, US Dollar would lost its status as a Fiat currency (or universal currency) and will see the huge depreciation. Countering Tax Evasion is the Solution to the Soaring Deficits? With the Governments facing rising budget deficits while combating the economic crisis, tax authorities around the world have agreed on a plan to encourage tax compliance and counter tax evasion specially focusing on the banks, financial institutions, wealthy individuals and offshore investments. US, which have announced trillions of dollars of bailout packages to protect its economy is going to face significant rise in Debt to GDP ratio, perhaps would excess the 100% mark. The bailout packages, which cost nearly $5 Trillion to the American Taxpayers, will have to endure this strain possibly for the next decade. But the Indian economy in particular, which largely depends on the foreign inflows (FDI or FII) should check the rising fiscal deficit in order to maintain its sovereign rating. Higher Inflation prospect? Lets check the Indian Government’s borrowing in the last four quarters of the financial year 2008-09. The given below table shows the borrowings of the Indian Government in the last four quarters of FY2008-09. The amount shown is in Crores (Ten Million) of Indian Rupees. The above table may not be accessible clearly. Please follow the link to access the full length We really apologize for the inconvenience caused to you. As you can see from the above table which shows the Indian Government Debt, which is continuously rising. The upward trend in the Debt to GDP Ratio is actually showing the signs of concern. This would ruin the country’s credit rating and makes credit expensive to all of us. Moreover, the rise in issue of Bonds to the central bank would force them to print more money and infuse that money into the economy which could lead to rise in stock of money. Currently India’s stock of money (M1) stood at $261.49 Billion in compare to $253.06 Billion in Mar 2009. Rise in money supply means higher headline inflation. 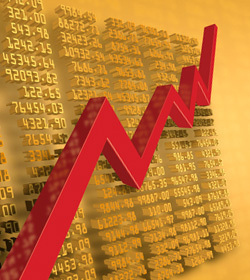 After the elections, there is a rise in optimism among the investors and businesses. There are lot of tasks which are pending to the new government. Prime Minister Manmohan Singh, which is also known as a Architect of the Indian Economy by opening up the Indian Economy since 1990s and the business leaders are expecting the same from the PM and his cabinet as they have a liberty to announce the favorable reforms for the Indian economy and to open up the Foreign Direct Investments (FDI) route in the sectors like Banks, Insurance, Retail, Infrastructure, Power and other sectors. After this, government should also need to focus on larger gap in Balance of Payment. Higher Current Account (CA) deficit is largely caused by the falling exports. As the Indian Economy is facing lot of challenges from the global economic downturn, so far the federal government had announced the two stimulus packages for the sector to enhance the potential of the export industry to survive in the challenging time and to boost the domestic demand and the industry is expecting the another stimulus package as the condition of the global economy is still looking uncertain. Not easy to answer! When the year 2009 was approaching after bloody ending of 2008, economist around the world were expected that the economy should continue to contract and even sharper than expected. Central banks around the world have slashed their interest rates further in order to fuel the economic growth engine and even the crucial G-20 summit in London also proved as a sturdy solution for this global mess. Global equity markets have regained their strength and recovered by more than 30% from their Mar ’09 lows. That is the strong thumbs up from the investors in response to the global authority. But economies like US, UK, Germany, France, Japan and other developed economies are still contracting and seeing the worst economic data in more than a decade. US economy in particular, will take at least five years to recover from the massive amount of losses that has damaged the country’s financial system badly. Now the trillions of dollars of bailout package has been announced in response to this crisis and this will probably swell to multi trillion dollars in amount in the next few years and indeed will convert into a huge deficit for the country, which will be inherited to the newer generation of the country. Indian economy is also facing the same challenge, and this threat must be contain for a fresh start of the global economy by following the determination of the G-20 Summit which was held in London, UK. So overall, the situation is sill in a very bad shape and the recovery in the global market is not showing the real picture. The rise in consumer confidence, business sentiment, and the perception about the particular economy would take some time to revive. This research was originally published by VMW on 25th May, 2009 but it has been revised further, latest by 18 Jun 2009. If you need any clarification in the VMW R&A, kindly inform us at vmw-r-a@vishalmishra.com. This entry was posted in Call Rate, Credit Crisis, CRR, Economic Crisis, Economy, Economy in 2009, Economy in crisis, economy in recovery, Financial Crisis, Financial Markets, GDP, GDP Growth, Global Economic Crisis, Global Economy, India, India Economic Outlook, Indian Economy, Inflation, LIBOR, Liquidity, Money Supply, RBI, recovery in indian economy, reserve bank of india and tagged call money market, Economic Crisis, global economic recession, global economic recovery, Global Economy, india's call rate, Indian Economy, indian money market, liquidity in india, Recovery in Economy, recovery in indian economy, US economy by THE UNIDOW POST. Bookmark the permalink.